French playwright; born at Paris, 1833. He devoted himself entirely to the drama, as playwright, as theatrical critic, and as editor of "L'Entr'acte," the theatrical column of the "Petit Journal." Later he became general secretary of the Porte St. Martin and the Gymnase theaters. He is the author of a number of comedies and vaudevilles, among which may be mentioned: "Chapitre V." (1863); "Le Lorgnon de l'Amour" (1863); "Les Parents de Province" (1865), with Jules Prével; "L'Amour d'une Ingénue" (1866); "L'Avenue des Soupirs" (1866); "Nicaise" (1867); "Les Petits Crevés" (1868), with A. Flan and J. Prével; "La Clef Perdue" (1876); "La Charité Chrétienne" (1885). 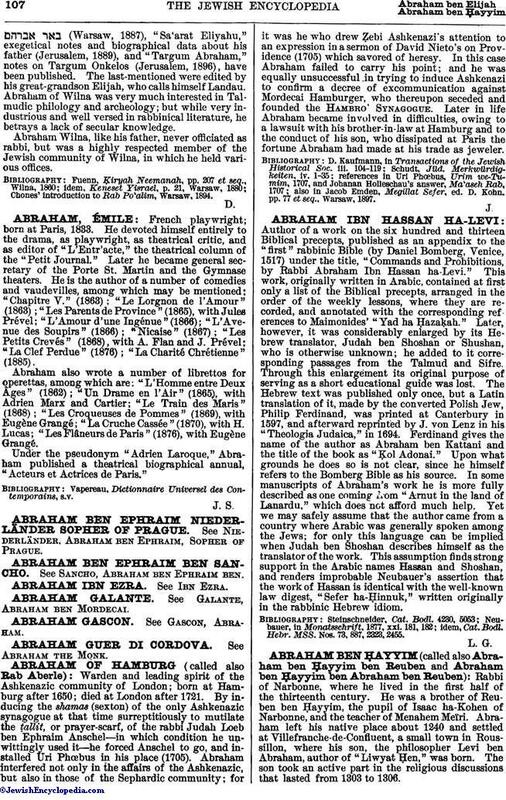 Abraham also wrote a number of librettos for operettas, among which are: "L'Homme entre Deux Ages" (1862); "Un Drame en l'Air" (1865), with Adrien Marx and Cartier; "Le Train des Maris" (1868); "Les Croqueuses de Pommes" (1869), with Eugène Grangé; "La Cruche Cassée" (1870), with H. Lucas; "Les Flâneurs de Paris" (1876), with Eugéne Grangé. Under the pseudonym "Adrien Laroque," Abraham published a theatrical biographical annual, "Acteurs et Actrices de Paris." Vapereau, Dictionnaire Universel des Contemporains, s.v.